Continuing the ‘series’ is our editor in charge of sales and marketing, Sammy Bishop. When asked to choose a podcast to flag up as my ‘editor’s pick’, one immediately sprang to mind: Chris Cotter‘s interview with Dawn Llewellyn on ‘Religion and Feminism‘. Starting on a personal note, this podcast was my initial step toward being involved with the RSP, as it was the first one that I provided a response to; and it was a joy to listen to their conversation. Not only does the discussion provide a great introduction to how feminism, religion, and the academic study of both, might (or indeed, might not) interact; but Llewellyn also does an excellent job of flagging up how future work in these fields could become more productively interdisciplinary. The interview was recorded in October 2016 – so is very new in terms of academic timelines – but even since then, various forms of contemporary feminism have enjoyed a huge rise in prominence. The themes raised in this interview have more relevance than ever, and are worth revisiting in light of recent discussions on the intersections of feminism and religion. Don’t forget about our Patreon appeal – if you can spare even $1 a month we could really do with your support. And remember, you can use our Amazon.co.uk, Amazon.com, or Amazon.ca links to support us at no additional cost when buying academic texts, humidors, curling tongs, and more. What does math have to do with religion? 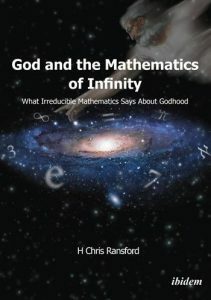 In his interview with Hans van Eyghen, author Chris Ransford discusses his latest book ‘God and the Mathematics of Infinity’. He discusses why mathematics is useful for thinking about religion, covering some of the conclusions he draws in the book. You can download this interview, and subscribe to receive our weekly podcast, on iTunes. If you enjoyed it, please take a moment to rate us. And remember, you can use our Amazon.co.uk, Amazon.com, or Amazon.ca links to support us at no additional cost when buying academic texts, Wu-Tang CD’s, Ramen, and more. Podcast with Chris Ransford (12 February 2018). Hans Van Eyghen (HVE): Hello, I’m Hans Van Eyghen, I’m with Chris Ransford to discuss his latest book, God and the Mathematics of Infinity. Welcome, Chris. So, could you tell us a little bit about your project, about the book? What was your motivation behind this? Chris Ransford (CR): Sure, Good morning, first! And thanks for having me on the show. This book, God and the Mathematics of Infinity, is actually part of a trilogy of books exploring the nature of reality. The motivation of that is because we are in the 21st century, and there is actually zero consensus in society as to what it is, this reality that we live in. So you have, at the one end of the spectrum people who still do believe in what is variously called materialism or physicalism, and at the other end of the spectrum you have fundamentalist religious people. And very often, of course, the truth has got to lie in-between, somewhere. But all my background, educational background, has demonstrated to me that mathematics is an extremely powerful tool to analyse the truth. And I have to immediately qualify this. A very large section of mathematics cannot be used to pronounce anything about external reality, simply because those parts of mathematics are predicated on axioms – which is foundational statements that are accepted at face value, that have not been proven. And on the basis of these axioms whole branches of mathematics are built such as geometry, let’s say. And they are internally consistent, but they cannot express anything about the ultimate truths of reality. On the other hand – the most important in my view and in other mathematicians’ view – part of mathematics is number theory. And numbers are actually not predicated on axioms, but on definition. In other words, one and one is called two. And that’s all there is to it. That’s a definition. And when you define one plus one is two, then very soon you have natural whole numbers, and then you have rational numbers, and then you have irrational numbers, and then you have infinities. And all of a sudden from the mere definition of two lions being two lions as opposed to one lion, a whole menagerie of very powerful numbers is born, out of which you can analyse – meaningfully analyse – reality. And one of my observations about, say, some religions and some atheistic people is that their pronouncements are totally susceptible to mathematical analysis based on numbers. And then you have a number of conclusions that you can draw from that. And, for instance, what religious people maybe do not understand about a mathematical analysis of God, it is actually not a mathematical analysis of God, per se. It’s a mathematical analysis of the consequences that flow from the attributes that are ascribed to Godhood. In other words . . . I’ll give you an example. If you define God as having infinite attributes, then the consequences of those infinite attributes are totally susceptible to analysis through the mathematics of infinity. Then you can conclude certain things. And you can conclude that certain things can possibly be and certain things cannot possibly be at all. And I am observing, in the current world, a debate between let us call them either religious or spiritual types on the one side and the atheistic or materialists on the other side. What I have observed, somewhat unfortunately, is that more and more the materialistic side seems to be winning the argument and they win the argument for a number of reasons and all of these reasons are actually susceptible, once again, to mathematical analysis. And one of the reasons why they win is because they conflate spirituality – the essence of what maybe religions have been trying to talk about for centuries – with the trappings of religions, meaning all the sometimes very silly trappings, such as singing hymns and reliance on ancient texts of literature and everything: all things that are actually epiphenomena of religion, but do not touch the core. And so the analysis by mathematics will enable you, first of all, to avoid things that are frankly quite infuriating in religion, such as the development, on the part of a number of big religions, of leaps of faith. Leaps of faith in this day and age, the 21st century, are not acceptable. And if a demand for such is maintained educated people, intelligent people, and more and more people in the 21st, 22nd, and so-on, centuries are going to leave religion, because in the modern age this is not an acceptable way of doing things. And, especially, leaps of faith are totally amenable to mathematical analysis. And I’ll give you an example. Some leaps of faith will lead to a contradiction in terms – and some have got to give way – and some will not. For instance, let us take the example of an acceptable leap of faith that would be – in totally non-religious terms – that would be the leap of faith of the person who buys a lottery ticket. A lottery ticket would have one chance in some million, you know, odds of gaining the jackpot, but it’s not impossible. So, in that sense, the leap of faith is acceptable. But the leap of faith that says that an infinite entity can be second-guessed by people who have limited IQs, a limited lifetime on earth and everything; the mathematics shows you that it’s a contradiction in terms. It is not possible that something infinite be properly appreciated, properly processed and properly comprehended by a receptacle that is finite. So we have to analyse all these sort of things. And on the other side of the aisle is, exactly likewise, susceptible to mathematical analysis. And I’ll give you an example, and then I’ll give you the floor. The ongoing argument that everything is materialist, and so on, is a bankrupt argument, because theoretical physics demonstrates that matter ultimately doesn’t exist. Matter is the vibrations of the quantum vacuum, of the vacuum. And matter reduces to vibrations of nothingness. And that’s the mathematics, that’s a fact. So people who predicate their reasoning on simply, you know, the fact that what you see is what you get, and that matter is all there is, are demonstrably wrong. And I will illustrate this by telling you about the latest book I’ve read. I’ve just read a book by a well-known philosopher. And one third, one big third of the book is given over to analysing physicalism. And that illustrates to me the absolute necessity to use mathematics. If that philosopher instead of philosophising and looking at the pros and cons and eventually – after one full third of the book – not settling the issue, had actually used mathematics instead, the mathematics is and the theoretical physics is that matter is vibrations of vacuums and that hence, therefore, matter cannot be the fundamental feature of reality or the fundamental trait of reality, and that therefore we have to move beyond matter to try to understand the fundaments of reality. And that, to me, illustrates the absolute necessity to bring mathematics into reasoning. We are in an age where we have on the one hand people like Isis, on the other side of the aisle we have people like Richard Dawkins who heaps scorn on millions and millions of people who say they have experienced something that they couldn’t explain. Both attitudes are not sustainable; both attitudes are not bringing us further into the 21st century and it’s absolutely time for us to have a new approach to the ultimate nature of reality: not use the science of last century, such as physicalism; but also not use the frankly bankrupt arguments that go “I base my worldview on a book of ancient literature written in a pre-scientific age, and my book is better than yours.” That is not sustainable. We’ve got to stop having that kind of argument. And it’s only at the price, or at the cost of stopping those arguments that we’ll be evolving into a discourse on matters of spirituality – maybe religion – and reality, that goes beyond the current debates that frankly are not taking us any further. HVE: Ok, thank you. I want to get into the point of not being able to second-guess God’s intentions, God’s commands. You’re probably aware that that’ll be a far stretch for many religious believers. But I was wondering, doesn’t that exclude the whole concept of revelation, in a way? What do you do with people who claim to have such knowledge? CR: OK, that’s fair enough. But it does, to a very large extent, and let me tell you why. The issue we have with most religions – virtually all, but this we can qualify – is that they rely for the message – if there is such a thing – the message of the Godhead – not specifying further who that Godhead is – they rely on words, be they oral words, be they texts. And the fundamental issue with that, we have to ask ourselves: is human language a capable vehicle, a possible vehicle to convey the words of a Godhead? And mathematically, as I will just show, there are at least four separate reasons why it is not the proper vehicle. It’s not the proper vehicle for at least four independent mathematical reasons. And the bottom line of those reasons is that human language is so inherently limited. So we could have an ideal human language but it cannot convey God-like thoughts. Because God-like thoughts are, by definition, infinite and they reflect a certain mode of thinking that cannot be expressed by the vehicle of the human language. And let me give you, if that’s ok, let me give you four reasons. The first one is very simple and it’s agreed to by all religions, including religions of the (audio unclear). It is what is called in mathematics Tarski’s theorem or the undefinability theorem, which very simply states that the proof of any statement cannot be possibly made from inside the language that makes the statement. It’s very easy to understand if I tell you, “This car is blue,” I cannot prove from inside the English language that the car is blue. I need external corroboration, which is quite obvious. The second proof is a little bit more subtle, but it’s exactly the same thing as the Mercator projection in map-making. In map-making, if you want to degrade by one dimension, you massively warp and distort the map that you’re trying to convey. If you look at the map of the world on Mercator, or for that matter any other projection, the point which is the pole becomes actually as long as the equator. So something rips. It’s like if you were going to flatten an orange upon a table – something rips, and by the process of ripping you sustain a huge loss of meaning of the data that’s being conveyed. Look at any Mercator map on the wall. Greenland is actually less than 1/4 of the size of Australia. Any map of the world shows Greenland bigger than Australia. And so on and so forth. And that’s just by going down one dimension. And if you go by two dimensions you would have to project onto a segment and all would be lost. Now let me give you an example with language. If you’re going to want to say, for instance, you’re going to want to translate into normal language Einstein’s works that space and time are the same thing; you’re going to write a book about Einsteinian physics and you’re going to entitle the book Space-Time. Now that’s wrong. You have actually prioritised space over time by writing space-time. And now you try the other way round- Time-Space- same problem. And finally you hit upon the solution which is to go up by one dimension and write it in a loop. And when you write space-time in a loop you have no priority; no first and no second element. And by going up two elements you have solved a problem of something that you couldn’t properly express in the English language, because of its linearity. And to demonstrate that this linearity is true, try to tell your publisher over the phone that you write space-time on the front of your book, you can’t. You have to write meta-data, which means you have to explain how to do it, because the language doesn’t allow you to that. And if you are talking of an infinite mind expressing God-like thoughts, you multiply this by infinity. You’re not having 2-d down to 1-d, you’re having infinity-d down to 1-d – which is the language that is used in ancient texts. Now let me give you a third reason. There exists a well-known phenomenon which is called emergence. Emergence is that whenever any constituent element to something becomes very big – not necessarily infinite – then you have all kinds of totally unpredictable phenomena that start happening. And when left alone. When things become infinite then you have a plethora of inherently unpredictable things that start happening. So for an IQ of 100 or 200 or 300, trying to second guess or to understand an IQ equivalent of infinity, simply the simple phenomenon of emergence cannot let you do that. And, really, if you had a . . . I hate the word prophet, but if you had a soothsayer or a translator of what the Godhead says, he or she would fall victim to the dimensional issue that I was talking on earlier. So you cannot get out of it. And the last element – there are more – but the last element I would like to quote here. Apart from the undefinability theorem, apart from the dimensional issue which is un-crackable, apart from the phenomenon of emergence which you cannot possibly predict or foretell, there’s also the phenomenon – very often in human religion – of circular reasoning. In other words, and to caricature it: “It’s true because the Bible says it’s true.” And I’ve seen that in my classes, in my Sunday classes. I have heard a lot of those arguments. And I find it a pity that we are still there in the 21st century because that gives ammunition to the Richard Dawkins set, if you like, who deny any spirituality even though there’s overwhelming proof out there that there is such a thing as spirituality. There is such a thing as higher dimensions and everything. All those things give ammunition to this set of people who cast scorn and aspersion on anybody who has a spiritual component to knock it, scoff at it, say that it’s all delusions, liars and straw that weaker minds are clutching at. And I find it very, very problematic and very regrettable that this be the case. And what I want to say, if we do not move into a rational intelligent type of spirituality, spirituality will lose the debate in the coming decades, let alone the 22nd century. And that will be a huge loss for humankind. HVE: Ok. I want to get into the conclusions you draw in the book, about God’s attributes. Some are quite classical, some widely accepted, at least if you have a religion, like all-knowingness, almightiness. But some are quite surprising. Could you maybe elaborate on those, the surprising conclusions you draw? HVE: The one, for example, about God being present in everything. CR: That’s very good. That exactly another, for me, absolutely essential proofs that the use of mathematics is indispensable. The debate between what was called immanence or transcendence has been a debate that has gone on for a very long time. But it has never been settled by theologians. And you have two schools of thought. So in all religions some think that God is everywhere, and some think that, if God exists, that God is in a privileged realm, somewhere, a heaven and only forays into lesser realms or other areas, when needed. The problem is, you can analyse that mathematically and on the basis of theoretical physics. And the analysis is not entirely obvious because you have to analyse time first. How could . . . . If God is not present anywhere, then if God would want to cast an eye on something that happened it would have to go back in time and there are all sorts of issues. But the demonstration that you get from that is that there is a stark mathematical contradiction between saying that a God would be all-powerful and omniscient – in other words all-knowing – and the fact that it would have Godly attributes. So it would actually negate the Godly attributes. So you cannot have it both ways. The possibility of God, of which mathematics itself – for reasons which I’ll go into in a minute – cannot actually determine . . . . If there is a God then that God must, if it is going to be divine – in other words if it’s going to actually have the attributes that are reputed to be its attributes by religions and spirituality, that actually constitute its very essence of being God, its very Godhood – then it must be present everywhere. And if you speculate, there are ways that this is totally compatible with the current world. I believe that the image of a personal God is not possible for all sorts of reasons. It’s not a bearded man in the sky or some equivalent of that. It’s not possible. But what is possible is that it’s a higher dimensional mind that actually moves through space-time in such a way as creating something that is not entirely circumscribed, and there would be reasons for that. Surprisingly – something that very few non-mathematicians appreciate fully – you can actually grow infinity. Infinity per se is not simply infinity. You can actually grow infinity. And if you do have an infinite God, put yourself in its shoes for two minutes and look what happens. You have basically two solutions. You can just soar upon nothingness and everything. The cost of that is that you are going to become a static God, and if that happens you are actually going to lose some of your divinity. Because what you’re going to become is a curator of something that is becoming a museum universe. You know the past, the future, you know the extension of space-time everywhere and nothing ever fundamentally changes. So you are infinite, but you’re an infinite museum curator because nothing changes. So your option out of that, and the thing that will preserve and uphold your divinity, your Godhood, is actually to have a universe that can grow. And the universe that can grow is not a trivial proposition. You will find, if you analyse in certain ways, you will find that you cannot grow it in certain dimensions: you can certainly grow it in a three dimensional space or +1 dimension time, but there are certain dimensions that are closed to you. And that is quite compatible, in some ways, with one of the advances in cosmology. You know that in cosmology a lot of very reputable physicists have tried to understand the Big Bang. And there’s many scenarios that actually give rise to a Big Bang. Many totally different scenarios that would lead to our seeing the Big Bang the way we see it. But it could be quantum fluctuation in a parent universe; it could be colliding super-brains in a 5-d space-time; it could be the existence of time before itself; it could be the bouncing universes and the bouncing universes have different ways of happening – there’s the Penrose way, there are some other ways. But what all of those scenarios have in common, in our quest to understand the Big Bang, is that they all require something to have been there before the Big Bang. So the best minds both in cosmology, in information theory, in many different ways, tried to understand and tried to work out how the Big Bang can happen from absolute nothingness. And the results were extremely interesting. The only plausible scenario was that the Big Bang could happen out of nothingness only if the disembodied laws of mathematics – so at least some disembodied laws of mathematics – existed prior anyway. So you come to a road where even if a Big Bang as we know it didn’t come from something material – such as a false vacuum, such as a prior universe, such as anything – it came from this incarnate mind. Because another way of proving it, with wave functions etc., the mathematical laws in that case would be alive. So you come to a possibility that the whole universe is actually part of . . . . If I may express it that way – it sounds terribly religious – and that’s for lack of a better word . . . . But the whole universe including your cup of coffee, the pen, a galaxy somewhere is part of the body of God. So that leads to a place where what we call God is not somebody personal, is not somebody judgemental, but it’s somebody alive, that has a possibility of disincarnate existence, that lets universes happen for very specific reasons. And those specific reasons are to grow, to grow infinity itself. And then we have a reconcilable of image of spirituality and science. And this is the only way that I see a place, the only proper way where we can reconcile the two. And all of a sudden, all of the sciences that were banished, such as studies – as you may be aware there’s a lot of studies on altered states of consciousness and so on. And all those studies are pooh-poohed by modern science because they are all afraid that it’s going to link them with religions with funny hats, with judgementalisms, with associations with books that were basically the Stephen King novels of 2000 years ago and when there was no understanding of anything, at a time when very, very few people knew how to write and they wrote what they could. They thought that earthquakes were the acts of God, they thought that diseases were the acts of God, etc., etc. And to become associated with that, of course, it’s a sure-fire killer in careers of science – as it should be. But the problem is we are stuck there right now. We are stuck in this rut where we either have the Isis people or we have the Richard Dawkins, and both of them have areas that they call no-go. It is haram – or whatever the word is – in certain regions to ask questions. It’s forbidden in almost all of them. Science does kind-of the same thing. When confronted with things it cannot explain under the current science, scientists sweep it under the rug as well. And take all the conflicts on earth today. They fundamentally all arise from that. And we’re not talking something that is not massive. We have massive conflicts. We have people who suffer immensely, like all those girls subjected to female circumcision because of ancient texts and everything. And we seem to be stuck in this course. And we have very many people who have experienced something that they can’t explain. And the explanations of Richard Dawkins just do not wash with them. So what do they do? They go back to those who say they know better, although they do not, and that perpetuates the cycle and the stand-off where we are stuck right now. The stand-off. And what I’m trying to say, we need to move forward. This is the 21st century. We need to free ourselves from spiritual reliance on ancient texts. And there’s no justification where those ancient texts should be deemed as being the corner-stones of modern-day religions – absolutely not. And you can prove they’re not suitable for the job. But we should also move from where that leads science to, which is wholesale rejection of whole areas of human knowledge. And we’re stuck, we’re not moving, which is the reason why I wrote this book, which is my second book in the understanding of the nature of reality. And, again, if you believe in God you believe in a totally different reality than if you don’t. If you believe in materiality, as in Aristotelian physicalism, then you believe in a form of the universe that other people do not believe in. And the whole point of the book is to say the force and the strength of mathematics is that it can actually analyse that intelligently, and enable progress. HVE: Ok, thank you. We’re running out of time here. Time flies . . . . One last question, because it will be on people’s minds, is the existential question. You refrain from answering it in the book, so you reach a limit there. CR: Yes. It will be part of my next book. Very quickly, I’ll try to tell you where I come from. Three hundred years ago we didn’t know where earthquakes, where lightening etc. came from. We had no idea, we didn’t understand atoms, electricity, tectonic plates, microbes. We’re still very close to that. The cutting edge of science has to do with wave functions. And things like this are not very well-known now, but that will actually further our understanding. And in the book I’m quoting somebody who’s actually atheistic, who’s a very well-known university professor in the US, who says we must define God in a certain way. And as she explains it – and I explain part of it in the book – the question: “Do you believe in God?” is meaningless. You have to define your terms. You have to define what God is. And my next book will try to answer this in the light of modern science. And we have to shed our preconceptions on everything. And I think we can actually come close to a definition that would be acceptable to most people, and in which we would say, “Well yes. This does exist.” And this can be construed as actually being a Godhead, and it has to be defined. And it’s got nothing to do with the personal God of the Abrahamic regions. But it has to do with the fact that there is something there that we’re not seeing at the moment, and with the fact that to appreciate that, and to begin – to use an old phrase – to touch the face of God, we have to have enhanced our knowledge, not simply to atoms, electricity, tectonic plates and bacteria but a lot more. And this is what science worldwide is in the process of doing. It will take us I believe another 200-300-400 years but we will get there. We shouldn’t jump the gun by saying we know already. No, we’re still in the process of building up our arsenal of knowledge tools that will let us put our arms around the concept. HVE: Ok. Thank you. I’m afraid that’s all the time we have. Thank you so much. CR: My pleasure. Thank you for your time. This past January, the Society for Personality and Social Psychology had its biggest turn out to date for its 17th Annual Convention in San Diego, California. Despite religion, as a broad category of research, all to often being missing in action in the psychological sciences, researchers embracing the study of religion were hard to miss throughout SPSP 2016. Conference report for The Religious Studies Project by Adam Baimel, University of British Columbia. The Religion and Spirituality Preconference meeting kicked off as Aiyana Willard presented her work on the cognitive foundations of belief. Much ink has been spilled as to what sorts of cognitive processes make supernatural beliefs ‘easy to think’ – Willard’s work demonstrates how we can actually test these theoretical and causal models in the minds of real believers (for more on this, see here). What this type of work demonstrates is that what we need, as psychologists, to understand religion in any sort of systematic way, is access to empirical data. Representatives from the Association of Religion Data Archives (the ARDA) drove this very point home by presenting both the existing (and quite impressive) database that they have built and what sorts of features users can expect from the ARDA in the near future. The ARDA currently offers researchers a large collection of international and national survey data on the broad topic of religion – and they have recently made mining through these surveys by topic and specific questions of interest all that much easier. Joining in on the benefits of open and transparent science – the ARDA has made a call for researchers to publish their data sets of all varieties (experimental, ethnographic, etc.) on the website in the hopes of the ARDA becoming the premier location of all that is empirical data on religion. Best of all, their databases are open-access – so get digging, I know I will be. The remainder of this year’s Religion and Spirituality Preconference emphasized how (1) the psychological sciences can add to our broader understanding of religion as well as (2) how believers can be an important population of individuals to study in furthering our understanding of more typical social psychological hypotheses. For example, Zhen Cheng and Kimberly Rios presented their work on the how stereotype threat – feeling at risk of confirming a stereotype of one’s social group – might play an important role in keeping religious believers from pursuing interests and performing in scientific domains. This is important to consider given the demographic majority of liberals, and atheists (or at the very least less-fervently devoted) amongst psychologists. Speaking to the complexity of how ‘religion’ manifests in human psychological processes and behavior, Joni Sasaki presented her lab’s work exploring how interactions between genetic differences in oxytocin receptor genes and social contexts moderate the strength of religious reminders in promoting self-control (full paper here). The theme of this bi-directional interest and value in exploring religion in the psychological sciences persisted throughout the remainder of the conference. The issue of replicability (and non-replicability) is currently a pressing concern for researchers in psychology, and was a topic of a number of presentations at SPSP 2016 (for more info see here). At the forefront of this ‘crisis’, and of particular interest to those who study religion, is work on priming. Psychological priming, the method of exposing individuals to some stimulus (often done outside of the individual’s awareness) to detect its effects on a later stimulus, is used in all sorts of psychological research. For example, Shariff & Norenzayan (2007), in their now foundational study, had participants complete a sentence unscrambling task that either involved god-related (e.g., blessed, divine), government (e.g., jury, contract), or neutral words. The mere presence of these words serve as a prime, making the concepts of god or government more readily accessible to the minds of their subjects. What they demonstrated is that activating god or government related concepts shifted the norm from being selfish (not giving much at all), to being more fair – as participants, on average, gave up just under half of their allotted windfall of money in a dictator game. These findings have served as the bedrock for continued exploration into the role of religion in sustaining human cooperation. Despite its varied applications (not just in the study of religion), recent efforts to replicate priming studies have lead psychologists to understand how complicated (finicky) these methods really are. However, as part of a symposium organized to demonstrate important examples of how and when priming is useful – Aiyana Willard presented the results of a meta-analysis (a statistical approach to studying an effect over a number of studies – in this case, 93 studies) that suggests that religious priming is indeed an effective method for studying the effects of activating ‘religion’ on a number psychological processes and behaviors. This effect holds even after statistically correcting for publication bias (the reality that there are many an unpublished study hiding in the physical and virtual file-drawers of researchers around the world). The psychological sciences face another important problem in understanding religion and more broadly, the psychological foundations of human nature – the over-representation of WEIRD (Western, Educated, Industrialized, Rich and Democratic) populations in our studies. Religion is by no means a monolithic phenomenon, and our understanding of religion should reflect the rampant theodiversity that exists across cultures today, and has existed throughout our collective cultural histories. In one symposium session, researchers representing the Cultural Evolution of Religion Consortium (CERC), with its home at the University of British Columbia, demonstrated how the study of religion is an ideal test case for breaking through this boundary. Michael Muthukrishna introduced the audience to the Database of Religious History and its goals of becoming a premier source for quantified religious history. This database is being built with the help of religious scholars and historians from around the world whose knowledge of diverse religious beliefs and practices is being mapped and quantified in order for history to move off the page and become subject to statistical inquiry. Edward Slingerland spoke to the value of moving beyond the laboratory and seeking answers to our questions about religion in what he called the untapped population of ‘dead minds’ in the process of quantifying and statistically mining the literary corpus at the core of many religions. Joseph Henrich and Coren Apicella presented results from a cross-cultural study exploring the relationship between big moralizing gods and prosociality in eight diverse societies around the world. Henrich spoke to the broader goals of such a massive undertaking, in that understanding cultural variation is key to understanding anything about human nature. Apicella presented her work on this project with the Hadza – indigenous hunter-gatherers in Tanzania who serve as an interesting case study for questions regarding religion and morality given that previous ethnographies have indicated that they have no religion at all. In (very) brief, this study supports the hypothesis that belief in omniscient, punishing, moralizing gods extends the bounds of prosociality to distant others – and thus may have played an important role in the expansion of human societies. For the complete report of the work presented at SPSP, check out Benjamin Purzycki et al.’s recently published piece in Nature. The work highlighted here is just beginning to scratch the surface of what was on offer at SPSP 2016 on the study of religion. However, what is clear across the board is that the general interest in religion as a psychological phenomenon is growing – with the countless poster presentations by the next generation of researchers as evidence. Furthermore, there is a growing consensus in the field that religion is not only an interesting phenomenon to study – but an essential one to explore in furthering our understanding of human psychological processes and behaviors. The implications of the latter question are considered by Jason Ānanda Josephson, scholar of East Asian religions and religious studies theory, in this informative interview with the Religious Studies Project. Josephson and interviewer Brad Stoddard explore how the concept of “religion” was translated, discussed, and applied in 19th Century Japan. Josephson’s book, The Invention of Religion in Japan (University of Chicago Press, 2012), forms the backbone of the conversation. Josephson explains that he has always had an interest in East Asian religion, as well as the theory of religion and religious studies, and in his doctoral research he put those pieces together. The result is a book that critiques the category of religion using the Japanese situation as a case study. Josephson relates how, in post-1853 Japan, there was a significant discussion taking place among the Japanese elite about what the European idea of “religion” meant, how it fit (or didn’t) with existing traditions in Japan, and also, how the concept of the “secular” applied to Japanese society at the time. Josephson’s primary case study involves Shinto, rather than Buddhism, although Josephson hopes to explore Buddhist traditions in Japan in a future work. Josephson’s critique of the category “religion” as it relates to Japan is part of an on-going discussion among scholars as to the accuracy, relevance, and necessity of that concept. (Scholars such as Timothy Fitzgerald, Russell T. McCutcheon, Talal Asad, and Tomoku Masuzawa are mentioned in the interview as key figures participating in this critique.) While I would not describe myself as a theorist primarily, or consider my main interest to be theories of religion, I have come to realize that questions about the nature of “religion,” what scholars mean when they write about “religion,” and the categorization of “religious” traditions cannot be overlooked and must be grappled with prior to studying a “religious” tradition. When I was a student in the Japanese Religion course, I had not yet been introduced in a meaningful way to the critiques of the concept of “religion.” What seemed problematic to my novice eyes was the disjunction between the different implications of the phrases “religion in Japan,” “Japanese religion,” and/or “Japanese religions.” By the end of the course, I decided that the least problematic way to think about the topic was as “religions in Japan.” This didn’t tackle the truly important piece – namely, the category of “religion” – but it did seem to be more neutral and inclusive than any of the other phrases. In my graduate work, these questions of naming and labeling recurred – my interests centered around one of the Buddhisms in Japan, not the monolithic idea of “Japanese Buddhism.” The latter implies that there is one Buddhism that can be described as Japanese. I can think of (at least) two traditions of Buddhism that flourished and took on a “Japanese” approach over time, as well as several of the New/Emergent Religious Movements which originated in Japan and claim a Buddhist lineage. Ultimately, the use of terms like “Buddhism” and “religion” in the singular seem to be neither specific nor descriptive enough to capture the richness and diversity of the actual world. Josephson’s perspective adds that necessary final dimension to anyone studying “religion” in Japan: since it is both an imported and manufactured category, can it be used reliably by scholars to discuss Japanese traditions? In the interview, Josephson mentions in passing that the title of his work (The Invention of Religion in Japan) could have just as easily been either The Invention of Superstition in Japan or The Invention of Secularism in Japan. I find this a particularly fascinating comment, as those three words – religion, superstition, secularism – each have a distinct implication. However, as Josephson demonstrates throughout the interview, Japanese society had to come to terms with those three ideas as a package. Was Shinto a religion or superstition? What about Buddhism? Is Japan a secular nation? Is Japan a modern nation? Since one could not be both “modern” and “superstitious,” that meant that Shinto could not be a superstition if Japan wished to take its “place” among the nations of the modern world. However, Josephson also points out that while colonialism often imposed categories upon a colonized people, that was not entirely the case in Japan. Japanese scholars involved in the (literal and cultural) translation of the concepts of religion, superstition, and secularism investigated what these terms meant to Europeans and then negotiated the idea within Japanese society, demonstrating a degree of agency not often seen during interactions between Western and Asian societies in the 19th century. Not only am I eager to read The Invention of Religion in Japan, but I am also looking forward to Josephson’s next project, discussed at the end of the interview. The project is currently titled “Myth of Disenchantment: Magic, Modernity, and the Birth of the Human Sciences”; Josephson describes this as a project to analyze European society, specifically those parts of Europe that did not match up to the claims of modernity made by European scholars. Josephson’s novel approach analyzes these claims of modernity – and the disjunction between scholarly claims and reality – through the lens of postcolonial theory, using the world outside of Europe to analyze Europe. 1 Or at least, that’s my recollection of the instructor’s remarks! I am paraphrasing, not quoting directly. Asad, Talal. Genealogies of Religion: Discipline and Reasons of Power in Christianity and Islam. Johns Hopkins University Press, 2009. Ellwood, Robert S. Introducing Japanese Religion. New York: Routledge, 2008. Fitzgerald, Timothy. The Ideology of Religious Studies. Oxford: Oxford University Press, 2003. Josephson, Jason Ānanda. The Invention of Religion in Japan. Chicago & London: University of Chicago Press, 2012. Preserved in the Language of Pluralism. Chicago: University of Chicago Press, 2005. Tanabe, George J. (ed). Religions Of Japan in Practice. Princeton: Princeton University Press, 1999.